Recently, the generous support of IPKO Foundation gave rise to an unprecedented event for Prishtina which cast spotlight on the thriving entrepreneurship ecosystem in Kosovo. The LEAPin Prishtina conference offered youngsters from all across Kosovo life-changing stories told by some of the most renowned entrepreneurs Kosovo has to offer, like Arben Avdiu, the CEO of Trosha; Drenusha Shala, CEO of Baruti; Drin Mulliqi, CEO of Fafi and Armend Malazogu, Founder of Frutomania. Together with a cheering audience of youngsters and adolescents alike, we embarked on a journey of social entrepreneurship, IT and modern technology and career development. In the end, when all the patches were stitched into one garment, one key lesson emerged: One has to have the audacity to follow one’s dream against all odds. Failure, upsetting as it can be, is a hurdle that can be overcome, and it should be seen as a powerful lesson. When all was said and done and valuable insights into the psyches of successful entrepreneurs were won, youngsters in the audience were informed that a few of them will get a chance to travel to Zagreb for the LEAP Summit 2017, which was to gather more than 2,000 Millenials and change-makers from more than 30 countries to explore leading approaches to social innovation. 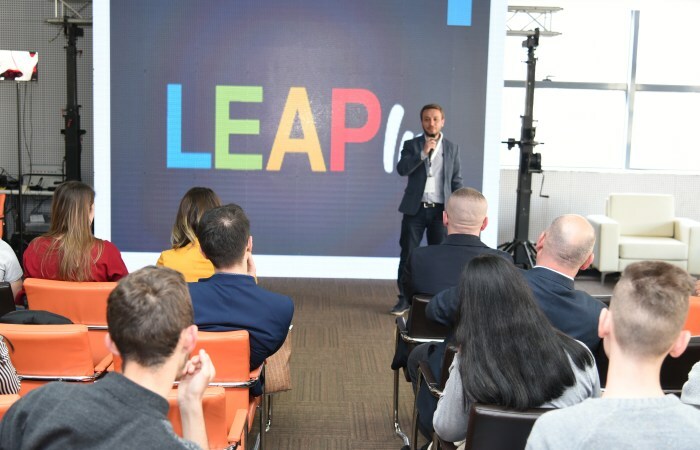 The high demand for LEAPin Prishtina was another testament that there is a high interest among young people to learn about the intricacies of entrepreneurship in Kosovo. And as part of IPKO Foundations’ and PEN’s joint efforts to promote innovation which catalyzes social development, we look forward to many more collaborations in the future for the benefit of Kosovar youth. Peer Educators Network (PEN) is a non- governmental and non-profit youth organization which has been an ally of young men and women for more than 10 years now. Through programs like the Innovations Lab Kosovo, the organization has built the skills of adolescents and youth and provided spaces for them to exercise those skills in addressing social problems.